Aussie Grit flint Bike Shell and flint Thermal Gilet review - LA VELOCITA. Round 2 of our Aussie Grit review featuring two more items carrying the flint designation. This time it’s the flint Thermal Gilet ($177) and the Shell waterproof jacket ($296). Two premium pieces we subjected to a winter of awfulness, and with the final test being a bikepacking overnighter. 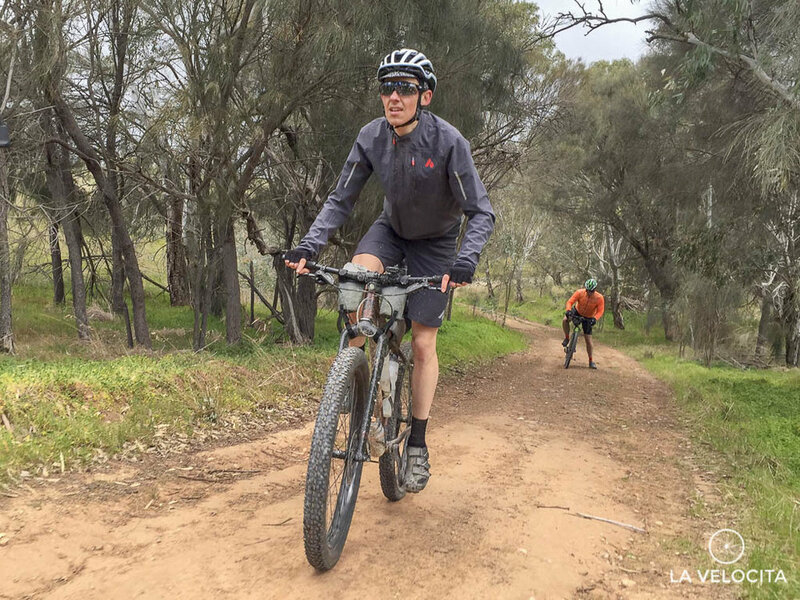 For those who missed our Aussie Grit flint Shorts and Trail Jersey review, this is the brainchild of ‘Strayan driving legend Mark Webber. He was a man unsatisfied with available apparel who took matters into his own hands, founding Aussie Grit to service the premium active/MTB/running market. It’s a brand for those who want the finer things in life. So how does their water proof jacket and thermal gilet stack up? The flint Bike Shell is almost a complete checklist of features you want in a waterproof jacket: long tail, good waist gripper to stop it riding up, high neck, waterproof and offset zips, and sealed seams. The aesthetic and functional touches include a chest pocket and reflective highlights on the back and front of shoulders. I say almost a complete list because I’m a fan of adjustable cuffs and there is only an elastic binding here. That’s important for me because, like in my previous Aussie Grit flint shorts and jersey review, I have some fit issues with this gear. In short, I’m too slim for Aussie Grit’s tops. My whippet physique exists off the small end of their size chart. Adjustable cuffs would’ve let me tighten the jacket around my wrists to better keep the elements out. It was fine when wearing thick winter gloves because the cuffs gripped nicely around their added girth. But smaller gloves, or no gloves, left a big opening around my arms. The rest of the jacket is just a little too big as well with voluminous arm and shoulder room. Again, I’m an outlier so this isn’t a criticism of Aussie Grit. They’re an MTB focused brand and I’m well outside common MTB shape. Just something for the very slender to be aware of. Now, let’s move past fit and talk about how good this jacket is for battling the elements. It’s darn excellent. A winter of trail riding saw me hit with everything from torrential downpours, savage hail, and insistent misting. The jacket repelled all of this with ease. The high neck and long tail meant that everything under the jacket was dry while everything else got totally annihilated. My bike packing trip had some apocalyptic weather that switched from sun, to rain, to destructive hail multiple times during the day. Again, the jacket shrugged it all off. It’s a decent jacket to use as an outer shell in the cold too. I wore it over the flint Thermal Gilet which give me some insulation and the sum total of the combo was lovely warmth and weather protection. I do have to take some exception to claims of being “breathable” though. It’s a near-universal claim of rain jackets and it’s still not strictly true. Some jackets certainly breathe better than others, but none of them breathe well. That’s the whole point of waterproofs; stopping water. The flint Jacket is decent for breathability compared to hard shell jackets but its got no vents or panels designed to release your warm air. So, breathable-ish and decent when compared to other waterproofs, but well behind something like a race cape or Castelli Perfetto style jacket. I came to think of the flint Jacket as an MTB equivalent of the popular race cape that I spent a lot of winter wearing on the roadie. Its soft and supple material feels great to ride in; significantly better than most hard shells. You have freedom of movement, and damn good weather resistance with the flint. My only small gripes are the lack of cuff adjustment and the sizing. Come on Aussie Grit, add an XS to your range. A good fit on me would make this jacket a home run. My roadie bias made me look a little skeptical at the flint thermal gilet. I’m used to ultra-light road gilets and this sure doesn’t look like those. Then I wore it and became an instant fan. There’s a ton of great design choices that make this a sterling item. The flint Thermal Gilet uses numerous material panels and places them very well to build an excellent gilet. The front and shoulder panels are wind and water repellent on the outside, with internal brushed inner lining to keep your torso warm. The back panels are much lighter, with a strip down the centre dotted with holes to aid ventilation. There’s a full waist gripper to anchor it around the waist too. The lower back features two generous pockets to stash gear in for easy access. One is zippered, the other covered with a flap at the top. I came to enjoy wearing the flint gilet during my cold winter riding. It’s a pleasant change from road cycling designed gilets oriented towards ultimate lightness. The flint has a nice warmth to it thanks to the brushed lining and dissipates heat very well with its back panel holes. I enjoyed having the large pockets that are easy to whip things in-and-out of rather than trying to get into jersey pockets underneath. Really, I only have two problem. Fit; again, a little too big for me and it’s not a compact garment. You can’t stash it away in anything other than a bikepacking bag - which I did - so all other times it’s on you the whole ride. Other than those, it’s a damn good piece for cool conditions or the Spring/Autumn seasons. The flint Bike Shell and flint Thermal Gilet are very nice pieces that compliment each other well. Anyone looking for a supple, comfortable, and very weather-resistant MTB-focused rain jacket and is willing to pay the premium $296 price should put the flint on their short list. It’s an excellent jacket. Just be aware of the bigger-than-roadie sizing. The flint Thermal Gilet is a damn good piece too. It’ll keep you warm, help you breathe, and carry a decent amount of swag in your pockets. It’s not going to put up much of a fight to rain, so think of it on cool, dry days, or accompany it with a jacket when in gets damp. Aussie Grit’s garments have impressed me with their thoughtful design and quality material choice. They’re doing very well for such a young brand so I’ll be watching their development closely. Head over to the Aussie Grit website to learn more or buy some swag. Disclosure statement: This was sent by Aussie Grit for review. It isn’t paid, and we receive no money for sale of Aussie Grit apparel. Gore Bikewear have thrown some of their exceptional textiles into the Windstopper Active Shell Vest. This thing ain’t for luxury, it’s all about performance. How does this new premium jacket from Rapha perform?